InLife (Insular Life) has kick-started yet another round of its much anticipated CASHandog! With the promise of a multi-million peso prize for the lucky policyholder, spending a few minutes updating contact details doesn’t seem all that taxing anymore. CASHandog aims to get valued policyholders to update their contact information and compliance requirements through a series of monthly draws. 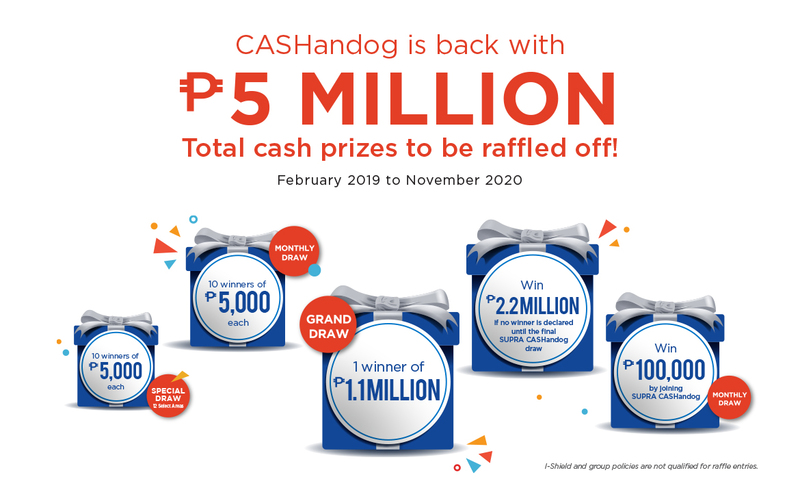 Under the program, 10 policyholders will win P5,000.00 each in the monthly CASHandog Raffle draws beginning February 2019. Monthly Draws will run for 22 months until the Grand Raffle in November 2020, where a P1.1 million cash prize will be at stake. With the re-energized version of CASHandog, InLife is sweetening the pie. In addition to the regular CASHandog Monthly Draws, policyholders are also entitled to participate in the SUPRA CASHandog. They simply have to choose six (6) unique numbers from 1 – 40, which will become their SUPRA CASHandog raffle entry for the Monthly Draws. P100,000.00 cash prize shall be given away monthly. Six (6) numbers will be drawn to determine the winning six (6) number combination for the month. If the drawn number combination does not match any SUPRA CASHandog raffle entry, the monthly prize will be added to the next month’s prize. This could potentially accumulate to P2.2 million in the Grand Raffle draw in November 2020. If you are an InLife policyholder, just fill out and submit a Customer Information and Compliance Form (CICF) and you are in for the chance to be one of the lucky winners of P5 million total cash prizes, tax free! Updating your customer information will allow InLife to serve you better through quick and efficient communication. Get the latest updates in a timely manner about your policy, new products, added services such as premium reminders and benefit due reminders, invitations to special events, and other news. For more details and program mechanics regarding InLife’s re-launched CASHandog, contact your Financial advisor or call Customer Care at 876-1-800 for Metro Manila or 1-800-10-INSULAR (467-8527) toll-free for provincial areas.